Kit recently assumed the position of Music Librarian for The Little London Winds. She has played clarinet in LLW since 2000 and has a degree in music performance (clarinet and voice). She is also a member of the Colorado Springs Chorale. Kit has been a music librarian since high school (band) and was a church choir director for 7 years. 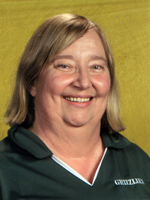 She retired from Air Academy School District 20 after the 2013-14 school year. Most of her D20 career she was a Band Aide for the bands at Challenger Middle School, Rampart High School and Mountain Ridge Middle School which included taking care of the band music. Kit is married to Paul who plays bassoon. They have 3 sons and 8 grandchildren. Two of their sons are percussionists, the other is a bass player. They have lived in Colorado Springs almost 40 years. What happens to a percussion who doesn't play his part right? They take away one stick and make him a conductor!